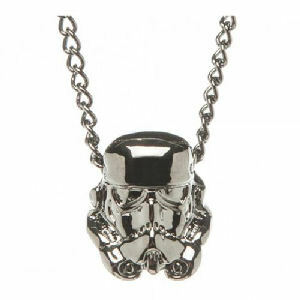 We have Just Sold out of Star Wars Stormtrooper 3D Gun Metal Necklace. This Item is unavailable at present. From the Star Wars collection by Bioworld. Star Wars Stormtrooper 3D Gun Metal Necklace. Shiny 3D Gun Metal stormtrooper helmet. Ages 14 and up. Bioworld Star Wars Attire shipping from Canada. No Surprise Border fees or Customs!